If you want to make your dinner rolls up to seven days in advance for your Thanksgiving dinner, I would recommend this brown and serve method. I have used this method for my Dinner Roll and Orange Roll recipes. You can use your favorite Cinnamon Roll recipe or my Feather Wheat Roll recipe. One year, I gave a dozen Orange brown and serve rolls to each of my neighbors at Christmas time. My neighbors loved popping these rolls into their ovens, drizzling sweet, orange icing on top for their Christmas morning! If you plan to give this type of roll away, include the baking directions and a Ziploc baggie of icing. 1. Shape rolls as desired. 2. Place on greased baking sheets, about 2" apart. 3. Cover with plastic wrap and let rolls rise in warm place until doubled in bulk. 4. Bake rolls at 275 degrees F for 20-25 minutes or until rolls just start to change color. 5. Cool in pans/sheets for 20 minutes. This will allow the centers to continue baking. 6. Remove from pans/sheets and finish cooling on wire racks. This will prevent rolls from becoming soggy. 7. Wrap in plastic bags and refrigerate up to 1 week. 2. Place rolls on ungreased baking sheet. 3. Place rolls in heated oven and bake for 10-12 minutes, or until golden brown. 4. 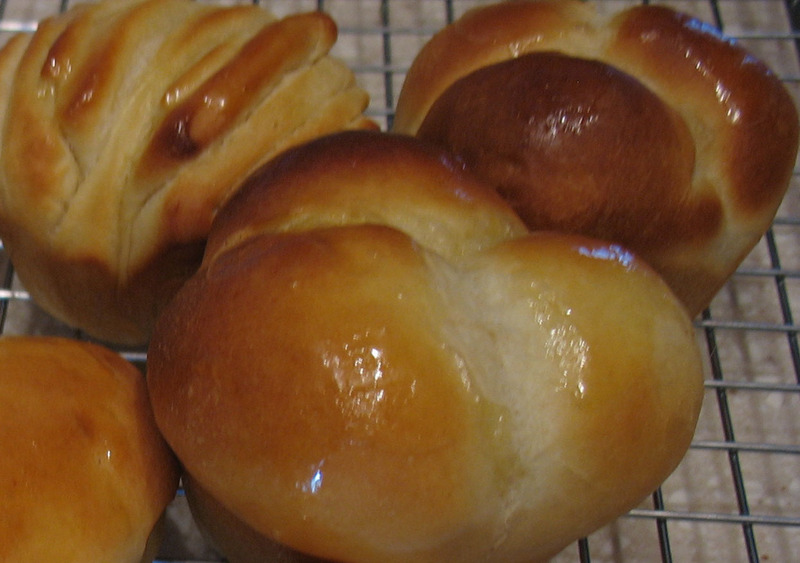 If desired, brush baked rolls with melted butter or margarine. I love this tip, Frieda! I seriously want to have you guest blog, but it appears I'm having some oral surgery on Friday-- so I'm out of commission for a bit. So many people have commented on my giveaway entries that they are afraid of yeast! Pish-posh! I think you would be perfect to help my readers conquer the fear of yeast, because there is nothing like homebaked bread! Personally, I'm on a bread baking mission! I was looking forward to this post. I thought I would have to freeze the rolls if I made them on Sunday. Nice to know that I can just refrigerate them! A very lovely post, Frieda!! Thanks for sharing your tips for making great rolls. This is great information. You make it sound so simple. You are the roll Queen! what about to freeze them? If you want to freeze them, try the recipe as outlined up to the shaping. As soon as the rolls are shaped, place rolls on greased baking sheets, cover w/plastic wrap and foil. Freeze till firm (1-2 hrs) Transfer to plastic bags and freeze up to a month. To bake, remove from bag, place on greased baking sheets, cover w/plastic wrap, rise in warm place (90 min - 2 hrs) and bake as directed.